Guru Orgyen Dorje Chang (Skt. Guru Oddiyāna Vajradhara; Tib. གུ་རུ་ཨོ་རྒྱན་རྡོ་རྗེ་འཆང་, Wyl. gu ru o rgyan rdo rje 'chang) is one of the Eight Manifestations of Guru Rinpoche. 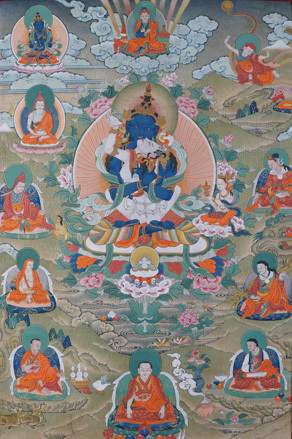 This aspect of Guru Rinpoche is sometimes visualized at the centre of the field of merit in the Nyingma tradition. Orgyen Dorje Chang is in sambhogakaya form, with its specific ornaments; holding vajra and bell and his legs in full vajra posture, he embraces white Vajravarahi.